20 times faster than current technology; could be used on SSDs and smartwatches. A California-based startup, Crossbar Inc, has come up with a non-volatile memory technology that could change the way we store data on our smartphones, tablets, and other computing devices. Crossbar has developed RRAM (Resistive RAM) technology, which allows a storage capacity of up to 1 TB on a single chip that is smaller than a postage stamp. 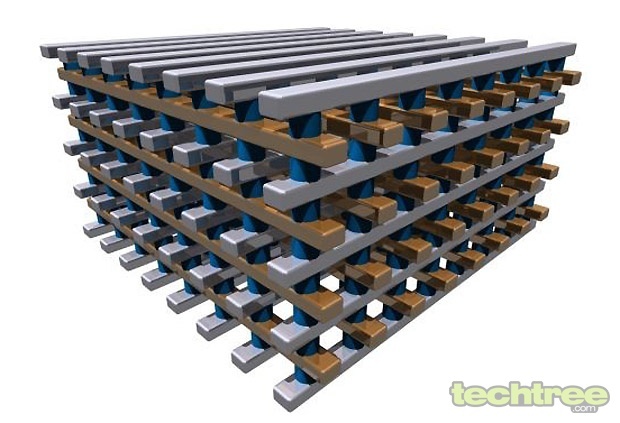 That's not all, stacking the chips could allow multiple terabytes of memory to be integrated on a single chip. This non-volatile memory delivers 20 times less power consumption than current NAND memory along with a faster write performance at the same rate. This could mean extending the battery life of devices by weeks or longer. Apart from the use on smartphones and tablets, these chips could also be used on SSDs for faster personal computing with tons of storage. Upcoming wearable computing devices such as the smartwatch or Google Glass could also benefit. Crossbar has already developed the chip at their commercial fabrication facility and is now optimising the technology for SoC (System on Chip) market. The company has already been awarded 30 patents related to manufacturing and commercialisation of the RRAM technology. Here is a visualisation of the RRAM in a 3D stack.